This time of year, everyone is getting into the festive spirit and bringing in decorations and decor into their homes. These beautiful yet simple elements bring in the beauty of fall and winter into your home easily and inexpensively. By using natural elements such as berries, twigs, pine cones, and leaves you can easily bring in the beauty of this wonderful time of year. These are unique ways to do just that- from Better Homes and Gardens magazine "Simple Decor Ideas Using Fall Favorites". These ideas in particular caught my eye because they are simple yet elegant. 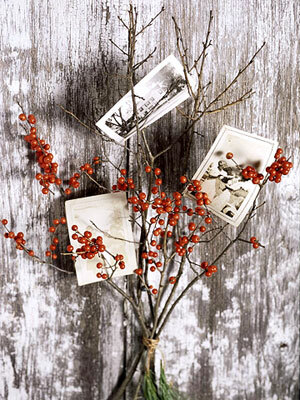 A twig arrangement can be used instead of a typical door wreath, or as seen here to display photos or all of the wonderful holiday cards that you receive. 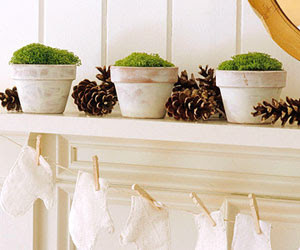 Use pinecones on the mantle or along the center of a table for interest. Also, try spray painting them with a metallic gold or silver for a more fun and contemporary look. 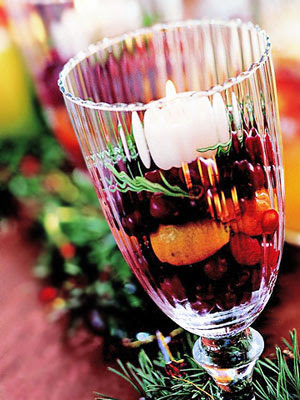 Candles are always a must for setting your table- try using fruits as seen int he last image or cranberries, coffee beans, or raw green peas to fill the glass votive, sit a candle on top and it makes a beautiful and unique candle holder. Just some simple and elegant ways to bring the fall beauty into your home.